I’ve been using Tweetr for some time and I’ve been perfectly happy with it… but I have to say that Snitter is pretty neat. By default it has a bright lime green skin, but you can change that to something more sober in the options. It also lets you specify transparency and “always on top” for the window, if you choose. Liking a few features… it has a system tray icon… I can see the last time it checked for tweets… the drop-down at the top lets me select between friends, followers, favourites, public, replies and direct messages (Tweetr only does my own tweets, direct messages and replies)… basically it’s more configurable, although that isn’t always a good thing, I know. Snitter doesn’t support sending photos or files, but those are features I’ve never used in Tweetr anyway. I’m also seeing a memory footprint around 1/3 the size of Tweetr, but that could be because I’ve been running Tweetr for a couple of days and there’s a leak or something. Not sure. One thing neither client does yet is support the new alerts… but those are done via notification anyway, so I guess the authors would need to make them into Jabber clients, which would make things much more confusing since I’m already on Google Talk. Which means I already get Twitter notifications there… so why use a desktop client in the first place. Just call me an application junkie and we’ll be quits. An annoying bug / foible in Snitter is that for some reason, it transposes the @ and ” symbols on my keyboard. On a UK keyboard ” is above 2 and @ is near Enter… works fine in Tweetr but Snitter seems to insist that the keys are the other way around. 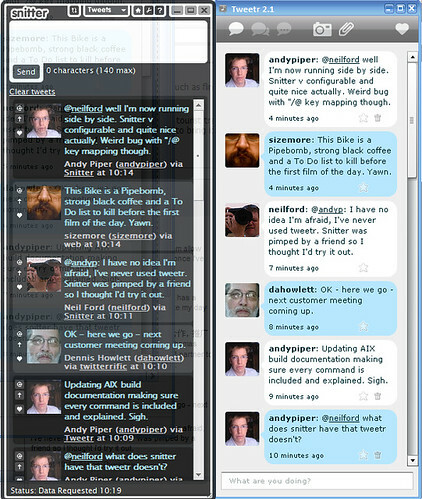 So anyway, Snitter is worth a shot, if you are interested in desktop clients for my favourite microblogging service. obv, snitter hasn’t been internationalized 🙂 US only. Bad Snitter. the US keyboard issue is an unfortunate side effect of using the HTML control within AIR (Tweetr uses Flash), I’m hoping this’ll be fixed in the next version of AIR. Thank you Andy! I could never get Tweetr to work for whatever reason but I really liked the way that it looked. Just installed Snitter and so far so good. What a great interface! Nice comparison, I had tried both of them, but found the lookahead feature in Twittr, which I think I didnt find (or missed it altogether). Using Tweetr now, and yes Google Talk interface as well. Interesting that you chose Snitter over Twitterific for the Mac, Luis. I actually prefer Twitterific for its Growl integration and menubar presence.